Problems with horse or pony paddocks come from a variety of sources such as boggy areas, weeds and moss, compacted soil, and bare or patchy grass leaving them tough to maintain. As the seasons change paddock owners need to adjust their maintenance and upkeep activities accordingly to combat these problems arising. 1. Analyse soil and fertilise to help boost grass growth 2. Harrow to remove dead grass and level off poaching areas to promote new grass growth for the spring and summer 3. Roll to repair damage caused during winter 4. Reseed areas were required such as gateways and fence lines 5. Top grass if required – keeping grass length above 5cm. 1. Top grass 2. Cut hay 3. Weed control 4. Re-seed paddock grass late August. 1. Top for final tie before winter 2. Chain harrowing by removing dead grass and level off poaching areas 3. Drainage management. 1. Paddock rotation 2. Fencing 3. Test the soil’s pH and Nutrient levels. The more effort you put into your paddock the easier it is to maintain and ultimately the more you get from them. • Remove droppings regularly – horses don’t like to graze on soiled areas, which encourages weeds reduces amount of parasites. • Avoid overgrazing – this will stop the appearance of patchy areas which encourage weed growth. • Testing soil – check soil pH and index of phosphorus, potash and magnesium are at the correct levels. • Remove poisonous plants – if grazing is in short supply, horses may eat poisonous weeds such as ragwort. 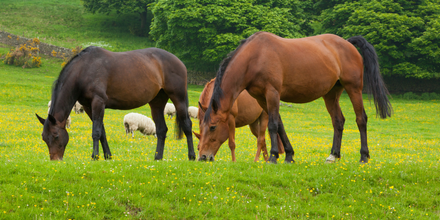 Read our guide to choosing the right grass seed for horse paddocks. If you wish to order more than 500kg of paddock seed please see our Bulk Orders section.